So here is the state of US foreign policy today: Donald Trump pulls the US out of the Paris climate change accord and the Trans-Pacific Partnership trade deal, and makes absurd demands for continuation of the Iran nuclear agreement and the North American Free Trade Agreement (NAFTA). But he cannot get the parties to any of these deals to renegotiate their terms, cannot get his top advisors to agree with his decisions, and faces intense opposition in Congress and among US allies. His tweets about “the worst deals in US history” reflect not only abject ignorance about diplomatic history and the diplomatic process; they also reflect an inability to articulate a thoughtful policy statement. Any normally conversant leader would understand the negative implications of these decisions for trust in the United States, for the larger purposes of multilateral agreements, and for peacemaking initiatives. Yet Trump leaves it to his advisers to rationalize what they cannot support. Not once has he articulated an alternative path to justify denial of climate change, confrontation with Iran, alienation of Mexico and Canada, and undermining of relations with Asian allies. In any ordinary circumstance, the foreign policy bureaucracy, which is responsible for the management of US international affairs, would be organized to facilitate the flow of information and implementation of well-vetted ideas. Instead, we have frequent reports on how the White House has become an “adult day-care center,” where the chief job is to soften the chief executive’s bombastic pronouncements and irascible behavior. However, neither the three generals—Kelly, Mattis, and McMaster—nor Tillerson seem capable of mustering the will or courage to rein Trump in or make end runs around him. In fact, all of them keep denying their intention to control or contain Trump; they’re simply wanting to give him information while stroking his insatiable ego (www.washingtonpost.com/politics/inside-the-adult-day-care-center-how-aides-try-to-control-and-coerce-trump/2017/10/15/810b4296-b03d-11e7-99c6-46bdf7f6f8ba_story.html). Sen. Bob Corker says he hopes these men will keep Trump from causing “chaos,” but that hope is illusory. Trump thrives on chaos. Indeed, “America first” in his understanding is a recipe for chaos—unraveling alliances, disrupting international institutions, and threatening adversaries. Take Tillerson, for example, a man who reportedly had very difficult relations with Trump even before calling the president a moron. Dexter Filkins’ profile of him in the October 16 issue of The New Yorker (“The Breaking Point”) reveals a corporate executive who actually fits well in the Trump administration. After all, they’re both businessmen who put markets first and something called the national interest farther down the list. Tillerson may differ with Trump on Iran and North Korea, and—as he told another interviewer—may, with his engineering background, have a very different decision-making style than Trump (www.nytimes.com/2017/10/17/magazine/rex-tillerson-and-the-unraveling-of-the-state-department.html). But their similarities are greater than their differences. 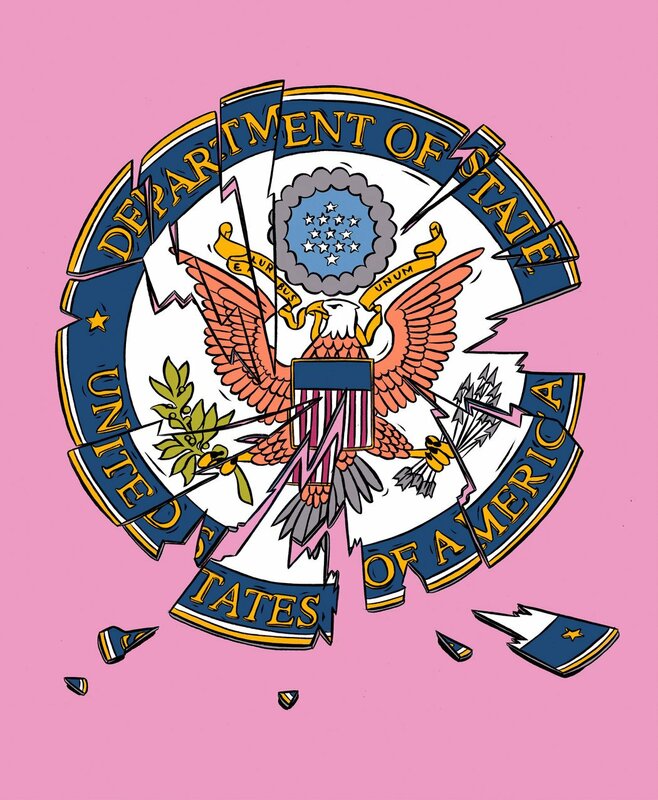 Tillerson has eviscerated his department: 48 ambassadorships vacant, 21 of 23 assistant secretary positions likewise, “at least three hundred career diplomats” resigned. He has shown indifference to human rights abroad, been party to Exxon Mobil’s financing of climate deniers despite its own scientists’ findings, and ignored State Department country and regional specialists—all elements of Trumpism. Tillerson’s behavior thus speaks to a failure of leadership, morality, and intellectual engagement that matches Trump’s. Tillerson soldiers on, supposedly guided by loyalty to Trump but perhaps just as much by greed: Exxon Mobil has a long record, recounted by Filkins, of bribes and payoffs to dictators and lobbying against sanctions (on Iran as well as on Russia). Exxon stands to gain enormously should sanctions on Russia end; it would give Tillerson an opportunity to exploit his personal ties to Putin and the other oligarchs. One wonders what motivates Donald Trump’s view of the world. Surely part of the answer is a desire to fulfill campaign promises and expunge Obama’s legacy on engaging Iran and Cuba and dealing with climate change. He may even believe in the principle of America first, though his conduct makes clear that “America first” means Trump’s empire first and the use or threat of force to protect it. His advisers are so busy trying to limit the damage of Trump’s impetuosity that they have left Trump free to determine who America-first serves—white nationalists, big corporations, the Pentagon, and dictators everywhere—and how they are best served—that is, by publicly aligning the United States with right-wing populists, authoritarian regimes such as Putin’s Russia, Duterte’s Philippines, and the Saudi royal family, and multinational companies that pretend to support jobs for Americans. No coincidence that these are the very groups favored by Steve Bannon and Jared Kushner. They, not Tillerson, McMaster, Kelly, and Mattis, are Trump’s policy shapers and strategists. We have a cabal in charge, not a professional team, and its head is an ignorant, spiteful, corrupt, and deeply prejudiced person at precisely the moment in history when the United States, and the world, need leaders who are fully human and thoroughly prepared. This is no time, John McCain said on October 17, for “some half-baked, spurious nationalism cooked up by people who would rather find scapegoats than solve problems.” Therein lies the tragedy of US foreign policy as the first year of Trump ends. MEL, Regarding the cabal (Post186), who really are “Trump’s policy shapers and strategists,” might not Stephen Miller be added ? Could be, though I regard Miller as Trump’s ghostwriter, not a mover and groover. Good one Mel. I especially like your assessment of Tillerson. The media has lately viewed him as a victim of Trump’s insanity.